Speakers in Code: Interview | Jeff Tweedy: "I don't ever feel committed to one emotion for very long." 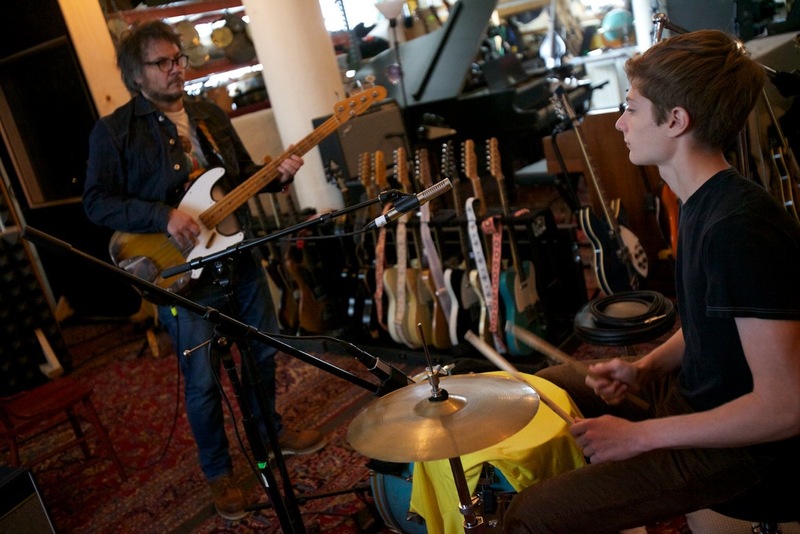 Interview | Jeff Tweedy: "I don't ever feel committed to one emotion for very long." 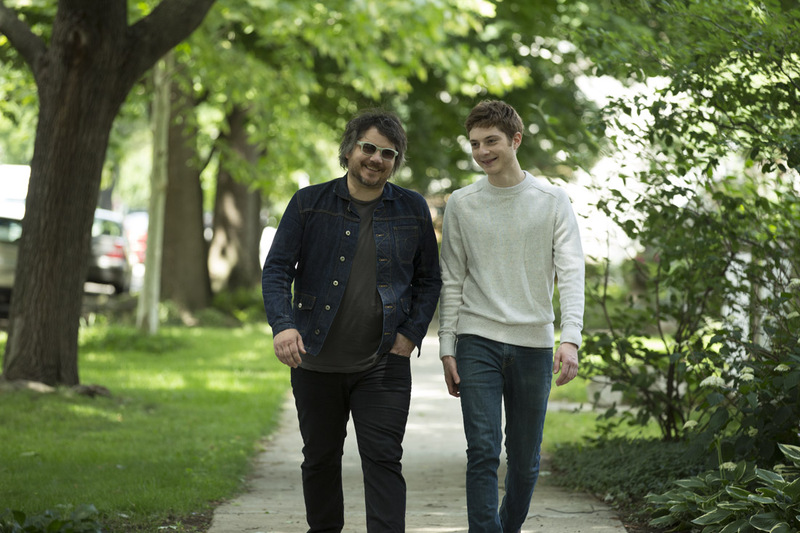 There are twenty songs on Sukierae, the new album released today by Tweedy, a duo featuring Wilco's Jeff Tweedy and his son, Spencer. And the song I'm most interested in is the one about a world where nobody dies. "Nobody Dies Anymore" is almost five minutes long, and I feel everything when listening to it: that maybe life is more interesting because there is an end; that because we'll all expire, we're blessed with urgency; that as things change, sometimes our only option is to be resilient. That it's beautiful we control our own effort to accomplish what we wish with our lives. If Jeff Tweedy has ever written a repetitive gem, this is it. Let's have a listen right now. It's been a dark year for the Tweedy family. As you might have read, Jeff's wife, Sue, is currently battling a rare form of lymphoma, and a group in her name is helping raise money to support the fight against leukemia and lymphoma. While you listen to Sukierae today, think about life, think about love, think about who you will hug the next time you see them. Think about what you always wanted to say to them, and do it. I recently had the chance to speak with Jeff Tweedy by phone, and we talked about Sukierae, "Nobody Dies Anymore," and, of course, Wilco. Jeff, it's getting hot here in St. Louis. I know that heat very, very well. A lot of people around St. Louis still talk about your LouFest performance from last year. Do you remember that? Oh yeah, of course I do. I had my dad there, and it's always memorable playing in St. Louis because there is always so much going on usually family-wise and everything. And now you're releasing Sukierae under the name Tweedy. You recorded it with your son, Spencer. I read a comment on a message board recently that said, "Oh, great, Tweedy. Name your album something I can't pronounce. Like that ever works." It's my wife's nickname, so it was kind of a way to honor her, because you know, it's Spencer's mom and my wife, and she's the central figure in our lives, and certainly surrounding the period making this record. It's been a tough year for you and your family. Did you begin recording this project knowing her lymphoma diagnosis? No, started it without knowing anything. But from around the beginning of February of this year on, it's been a pretty high anxiety time for our family, and I think the work was a welcome refuge for Spencer and I for some of the stress, but for also Susie and Sammy, who is Spencer's younger brother. There is some sense of normalcy in our family when music is being made, and when we're sharing it, and hearing some of it on the way to school. So that's why she's honored in the title. But, in general, things look good. She has a really, really positive prognosis, and we're all hoping for the best. But it's been difficult, as anyone who has ever been through any kind of health issue like this can tell you, it's just about the worst. When you don't know, it's the worst. Yeah, we went through four months of not knowing about a possible malignancy in a couple different places. Even though biopsies kept coming back clear, they wouldn't accept that as being the case, because they knew there was something really wrong. It could have been a lot of really much worse things than what it ended up being, not that what it ended up being is a walk in the park, but it would have had a much worse prognosis attached to it if it had been almost anything other than what it ended up being. Did it make you more vulnerable? If I could be an objective judge of my own work, I don't feel like I've shied away from vulnerability in my music. (laughs) I think it's been something I'm fairly comfortable with, so I don't know if it adds any more than what would normally be there. I do think there's always a heightened sense of meaning, not so much that there's more meaning to the songs, but there's more meaning to the act of making music, and the act of getting to do this thing that is not only fulfilling creatively, but is sustaining my family, and it makes it pretty poignant. I felt very fortunate despite all the heartache that we were experiencing as a family. I had a great deal of empathy for someone who wouldn't be in a situation where they could go to the studio and make some songs, and kind of lose themselves in that, but potentially would be working overtime and not able to be with their wife at the scan or at the chemo, you know? There's a lot of things to feel fortunate about. The song that sticks with me is "Nobody Dies Anymore." I'm a big lyrics guy, always obsessing over every line. And there is a lot going on in that song. But, the initial title was inspired by attending a lecture by this scientist who was basically claiming that the first person to live 1,000 years old is alive today. And what struck me most about his presentation was that he appeared to be more afraid of death than even you or I. (laughs) And I thought that there was a great deal to contemplate about that. Before you have people living to be 1,000, you might want to feed the people that are here. The song just kind of grew out of that notion, "what would a world be like with nobody dying anymore," and it's just a composite of a lot of different angles that I thought I could take writing that song -- and I ended up just combining them, you know? At one point there's a verse that's mostly about witnessing street-corner vigils that there are so many of in Chicago every summer for gunned-down teenagers, and how depressing and sad that is. In some ways, "I'm going where nobody dies anymore," a lot of that is sort of an old spiritual concept, where you're going to heaven where nobody dies anymore or something. But mostly, it was just an ode to the notion that I think it's good that songs end, I think it's good that people end. (laughs) It's really unavoidable. (laughing) It's not something you get to choose. Of all those things wrapped up in the song, I don't know if there's any concrete or coherent element to any of it except it's a confusing topic, and the song was built around not trying to resolve any of that confusion. I caught one of your live shows in Columbia, Missouri last June. I love how you opened the show with the new material -- the first set was all new songs from Sukierae. How did you feel that went, and are you going to keep doing shows that way? I think we have to do it that way. I think that this material does sound of a piece, it feels like it should be presented together. Maybe down the road sometime in the future some of the songs will live on their own and fare well. But right now, I feel like it's our little mini version of punk rock; I feel a little of that tension that can arise in an audience...there's a distance from their comfort zone, a distance from the familiarity that they're expecting. 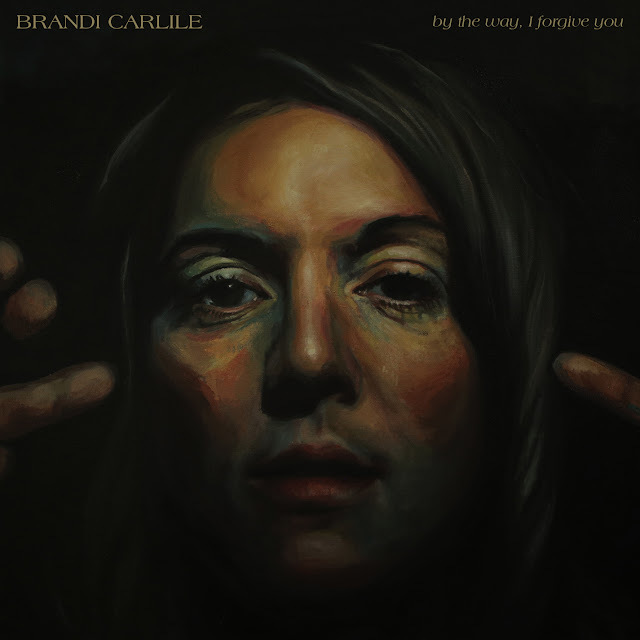 And it adds a certain immediacy to the singing of those lyrics, and singing to people that you really are reconnected to this notion that you're trying to tell a story or trying to communicate. I think that if I came out and I did a bunch of familiar songs first, and then we went into the set they we were playing...I think it would be a cop out. (laughs). It wouldn't be as natural. The show that I went to, I noticed that after the first three or four songs, people started to settle in and just be in the moment, which is kind of rare for a live audience these days because everyone is almost always so distracted. After the first set of Sukierae material, you played a solo set that included pretty much every phase of your career. And in Columbia, you played Uncle Tupelo's "Gun," and I remember you saying that you had probably played "Gun" more times in Columbia than anywhere else. What was going through your mind while playing that? (laughs) Well, Columbia definitely has a very powerful, I don't know, emotional landscape. (laughs) Definitely it struck me playing "Gun" in Columbia; I do think I remember feeling like I'm a survivor or something. (laughs) That I'm playing this song twenty plus years after it was written and twenty plus years after I the first time I played it to this city, and it was definitely not the same audience. That was what was striking, too -- it was definitely not the same audience. When you announced the Tweedy project, did you give any thought about how Wilco fans would react? I can't spend that much time thinking about how people will react. There's not much you can do about it, so it's kind of wasted energy. We felt like there were already shows booked for Wilco, so if they were really that concerned they could look at the calendar and see that Wilco's not ending. And most people that are fans of the band understand that Wilco has a long history of everyone in the band doing things outside of the band. So, we felt fairly confident that people would get it, if not right away, but eventually. Let's go back to Sukierae for minute, because I forgot to ask you this earlier. The two girls from Lucius, Holly and Jess, sing on a few songs. How did you meet them? Well, Ben Levin, who works with Tony Margherita, my manager, and Tony's management company, manages them, and we've known them for a while. I first fell in love with them from their Tiny Desk Concert and thought, okay, these girls are the real deal, you know? And we invited them to our festival, Solid Sound, and got to be friends with them. And I just love the way they sing like siblings, and I thought there's something about the way Spencer and I play together that has a similar...maybe not like siblings, but whatever it is, it's a DNA connection. So I thought that was interesting to me to combine that with the record Spencer and I were making. They're great. I went to one of your shows last year with My Morning Jacket and Bob Dylan. How was that, and did you get to meet Bob Dylan? Yeah, I mean, I didn't get to be best friends with him. I...(laughs) I did get to meet him. It was great. We had a really great time. We worked really hard the whole tour to make our setlists different from night to night. It was a liberated kind of touring experience. Basically, with not having the pressure of having the audience be there exclusively to see you. For me, I felt that was license to do whatever the hell we wanted to do every night. I'm sure that's a nice change of pace. Well, I figured -- the tickets were more expensive than a normal Wilco show -- and if anyone spent that kind of money to just see Wilco, they didn't come to hear what we always play. They didn't come for a "best of" or whatever. I feel their money was better spent if we played stuff they had never heard before. For me, the best thing about a Wilco show is that you can do a few rock songs and then pull out a song like "Reservations." You did that once at a show I attended, and I thought it was really beautiful. And I love it when you open a show with "Misunderstood," because that's sort of going through all the emotions. It's a scorched earth way of opening a show. Do you think about that kind of contrast when creating setlists? Yeah, I think that we strive to be better and better as a band, and one of the ways we feel like we get better is when we push ourselves to work within light and dark shades, and be able to present a wider range of emotions than maybe your typical rock band. And work with dynamics doesn't seem to be a big part of a lot of modern music presentation. Not to say that there is anything wrong with it, but there does seem to be a lot of bands right now playing a steady stream of the same dynamic over and over again. And...I don't know, it's just not in our nature. It's much more in our nature to express some sort of joy or anger and then recoil from it, and try and soften it somehow. Maybe that's just the way I feel. I don't ever feel committed to one emotion for very long; I don't think many people do. (laughs) I don't think it's very realistic to try and pick and choose your emotions, for one. It's much healthier to react to them and feel lucky that you have them.